Neoliberalism, inequality and climate change have led to millions of people in the Global South dying or being forced from their homes. As this planetary emergency tips us towards a point of no return, this session explores the logic of ‘sacrifice zones’ and the deliberate sacrificing of black and poor lives that has been inherent firstly in colonialism, and now neoliberalism and climate change. The panel will discuss how racism has shaped the dominant climate narrative and how can we decolonise environmentalism. 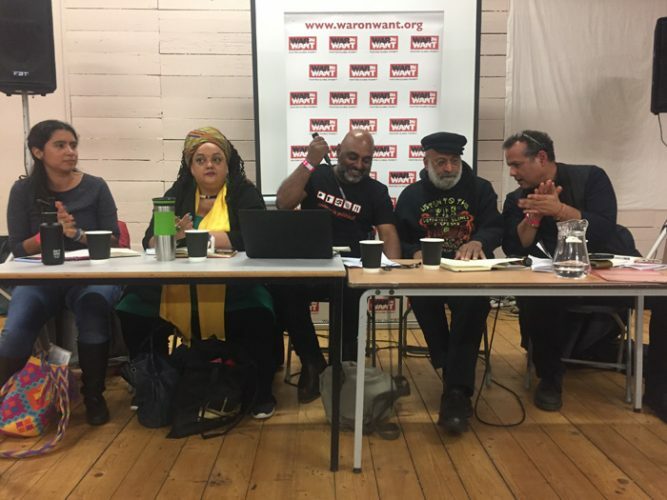 Apologies..Couldn’t record the last 2 speakers a Columbian female (sorry can’t find name) and Zita Holbourne vice-president PCS, BARAK (Black activists rising against cuts), activist, artist. Hope to add a link for their contributions ASAP.